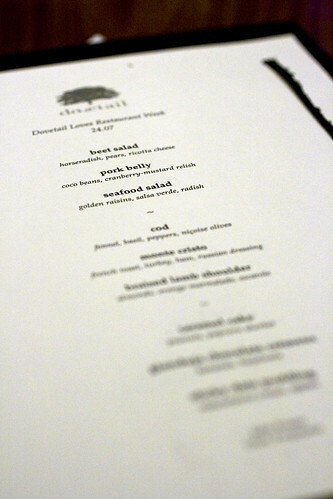 Dovetail was on my list of restaurants that I thought of eating one day. Not the MUST EAT list but something to try once. What sparked my interest was Frank Bruni’s review but reading a few different food forums, like Chowhound and e-Gullet over the past recent months, the foodie/gourmand community to appears to have a lukewarm or mixed response; also a friend of mine who went there a few months ago told me of a disappointing experience. I was ambivalent but I thought, “What the heck, it’s Restaurant Week. 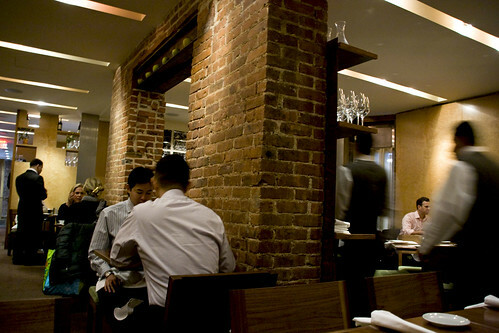 It’s not like I’m going to try their tasting menu and spend an absurd amount of money.” And took the available reservation the past Thursday afternoon. Checking in with the host, I was escorted to the small dining room, completely filled with diners, ranging from their 20s to a two parties of septuagenarians. Tables were relatively close to each other. The noise level was moderately loud with lively conversations and the occasional moments when I heard lively jazz being played in the background. As I was seated toward the back along the banquette, I was given the menu. 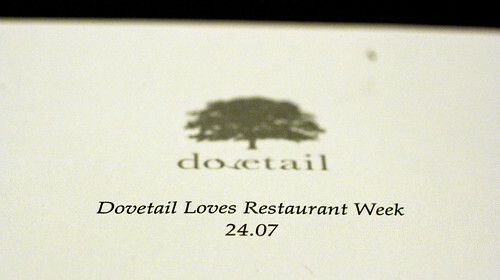 This particular line you see above, “Dovetail Loves Restaurant Week,” was humorous to me. I don’t think restaurants in general, loves Restaurant Week but I guess it’s better than little or no business when it’s the downtime of the tourist season as well as the economic slump that we’re all in. The white cheddar cornbread was served warm. 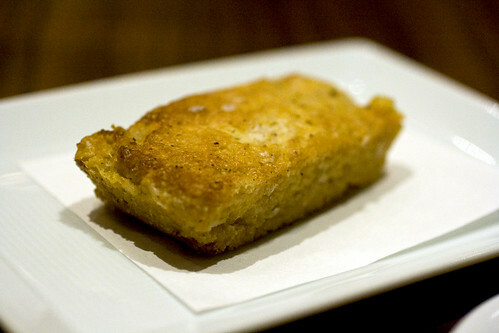 It’s soft, crumbly with a touch of gritty cornmeal, tasted sweet and salty. The drawback was that it’s too greasy for me, since there was a large grease stain left behind on the paper lining on the dish. 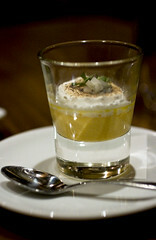 An amuse was served with the cornbread, a shot glass of sweet potato royale with melted rosemary marshmallow and fennel. First of all, I never encountered a restaurant during Restaurant Week serving amuses. I guess they do take RW with some gravity. This amuse was interesting when both parts were eaten in one bite – it was light and airy, tasted salty and cheesy yet sweet with a nuance of pungent rosemary. The fennel added a background of anise flavor and added a slight crunch. I liked this amuse but the gritty texture from the royale and the burnt marshmallow was a slight turnoff. 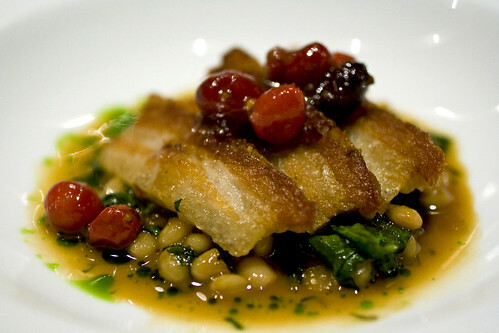 The pork belly with coco beans, Oloroso sherry and mustard-cranberry relish appetizer tasted as good as it looked. Crisp, fried exterior meets soft, creamy pork belly meat (or fat). The creamy, earthy beans played along with the pork’s texture and the tart cranberries that just pop in my mouth. Oh. My. Goodness. I liked this dish a lot. The braised Lamb Shoulder with carrots, almonds, blood oranges and yogurt entrée was quite interesting as well. 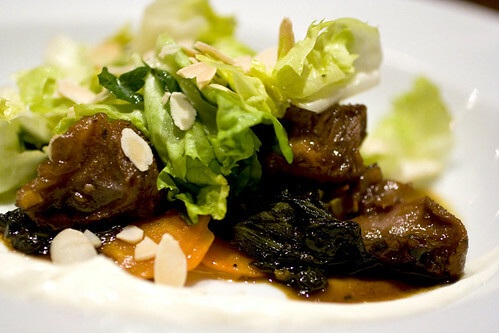 Tender chunks of braised lamb sitting on a swath of tart, creamy yogurt foiled nicely with the crunchy almonds, lettuce, and sweet carrot slices. 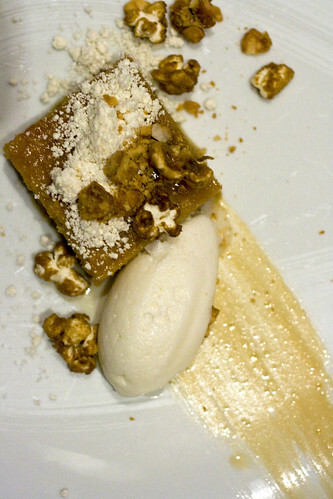 As for dessert, the caramel cake with popcorn ice cream and peanut butter powder didn’t fared as well as I thought of. My waiter described this dessert as a yellow sponge cake that’s soaked in caramel, served with popcorn ice cream and caramel popcorn. It is as what it’s stated. The caramel could have been more complex or have some kind of rich, creamy fleur de sel caramel on top of the cake. The popcorn ice cream tasted more like a sherbert than an ice cream. 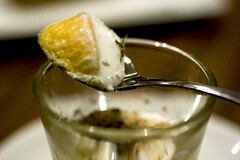 I didn’t like it nor love this dessert. Generally speaking, Dovetail has surprised me. Given the somewhat low expectations from them after reading so much about them. I would visit again. If I felt a bit disappointed from the dessert and have a need for something cold and creamy, I could go around the corner as the new Shake Shack is located and grab a small custard to go.